NOTE: *SWAPIP role swap type in Robot HA and Takeover IP Address in PowerHA are not currently supported. Also, ‘cascade flow’ (A to B1 to B2) for data replication is not currently supported. As part of this integration, be aware that Robot HA does not end all subsystems. The following are steps to be taken when integrating PowerHA with Robot HA within specific One to Many role swap configurations. These instructions are intended as a starting point for advanced configuration and in-depth product considerations within a larger role swap plan. You can supplement this information, where needed, with the Robot HA product documentation and your PowerHA User Guide. 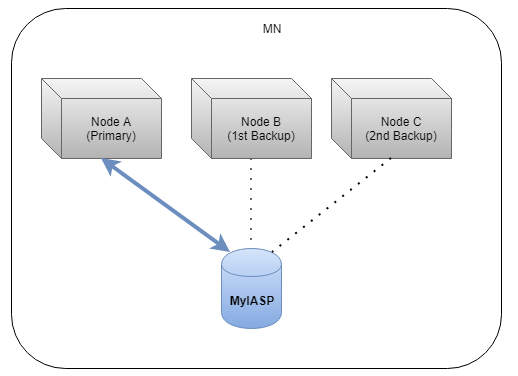 Configuration #1: A single copy of the IASP that is switched between the nodes. Configuration #2: Nodes A and B are sharing a single copy of the IASP that is switched between them, and then Node C has a second copy. Configuration #3: Node A and B share a copy that is replicated to the copy that Nodes C and D share. NOTE: The below setup steps use Configuration #2 above but can be modified to adapt to your specific configuration. [ ] On the *PROD (Node A), ensure that the TCP/IP server is running. [ ] On the first *BACKUP (Node B), ensure that the TCP/IP server is running. NOTE: RSFCFGBKP and RSFBKP libraries for BACKUP1 need to be changed to: RSFCFGBKP1 and RSFBKP1. [ ] On the second *BACKUP (Node C), ensure that the TCP/IP server is running. NOTE: RSFCFGBKP and RSFBKP libraries for BACKUP2 need to be changed to: RSFBKP2 and RSFCFGBKP2. [ ] Use a file utility to setup the backup records needed in file RBTHALIB/LSTBKP on the *PROD system in library RBTHALIB and copy the file to library RSFUSER. This file should contain only the Backup Systems. [ ] Sync the RSFUSER library to all backup systems. NOTE: Auditing is not currently setup for One to Many configurations. Auditing will run with the server from the last INZRSFHA command that was run. NOTE: The below scenario uses Configuration #2 above but can be modified to adapt to your specific configuration. [ ] End Sync jobs on all partitions before swaps. Leave TCP/IP server active. [ ] Select option 7, Role Swap Menu from the Robot HA Main Menu. Then, select 10, Role Swap. [ ] Choose whether you want to run the role swap from the system console, or specify *YES for Run in batch to submit the job to a job queue. [ ] If you want to flag the role swap as a test run, change Set test flag to *YES. Otherwise, leave the default as *NO. The option *NOCHG will use the value specified during the last role swap (this is helpful if your role swap needs to be restarted). EXAMPLE: Specifying *YES allows you to run different system startup programs, since it's flagged as a test role swap instead of a real one. [ ] Specify *YES for Are you sure?, otherwise the role swap won't proceed. [ ] Once you receive the message ‘Waiting for reply to message on message queue QSYSOPR.’, select the server name related to the node you are swapping to. (BACKUP1). [ ] On the *BACKUP system that was BACKUP1 Node B, run the following steps in Robot HA. [ ] Take note that the Server ID’s have been changed on ALL Backup Systems (Node A and Node C) to sync to the new *PROD system Node B. [ ] Start the TCP/IP server on the new PROD. [ ] CHGRSFSA LIB(RBTHALIB) TOLIB(TOLIB name) SERVER(PROD) SYNCDATE(*NONE). [ ] Run the appropriate Change command for any additional sync entries you may have on the additional Backup system that will sync to the new PROD. Change the SYNCDATE parameter to *NONE. [ ] Sync the entries to the new PROD. [ ] Release the RSFUSER/RSFHA job queue on all PROD and BACKUP systems. [ ] On the new *PROD (Node B), run INZRSFHA to reset the System for Node B as the preferred *PROD and Node A as the preferred *BACKUP BACKUP1. [ ] On the new *PROD (Node B), run INZRSFHA to reset the System for Node B as the preferred *PROD and Node C as the preferred *BACKUP BACKUP2. [ ] On the new *PROD system (Node B), update the LSTBKP file in RBTHALIB and copy it to the RSFUSER library to show that the System for Node A is now a Backup and remove the System for Node B. [ ] Sync the RSFUSER library to *BACKUP BACKUP1 (Node A). [ ] Sync the RSFUSER library to *BACKUP BACKUP2 (Node C). NOTE: The Robot HA IBM Job Scheduler Jobs will currently only be run for the last backup you ran INZRSFHA on. This will be changed in a future release of Robot HA. [ ] Start sync jobs on *PROD PROD (Node B). [ ] Start sync jobs on *BACKUP BACKUP1 (Node A). [ ] Start sync jobs on *BACKUP BACKUP2 (Node C). [ ] Once you receive the message ‘Waiting for reply to message on message queue QSYSOPR.’, select the server name related to the node you are swapping to. (BACKUP2). [ ] On the *BACKUP system that was BACKUP2 Node C, run the following steps in Robot HA. [ ] Take note that the Server ID’s have been changed on ALL Backup Systems (Node A and Node B) to sync to the new *PROD system Node C.
[ ] On the new *PROD (Node C), run INZRSFHA to reset the System for Node C as the preferred *PROD and Node A as the preferred *BACKUP BACKUP1. [ ] On the new *PROD (Node C), run INZRSFHA to reset the System for Node C as the preferred *PROD and Node B as the preferred *BACKUP BACKUP2. [ ] On the new *PROD system (Node C), update the LSTBKP file in RBTHALIB and copy it to the RSFUSER library to show that the System for Node B is now a Backup and remove the System for Node C.
[ ] Sync the RSFUSER library to *BACKUP BACKUP2 (Node B). [ ] Start sync jobs on *PROD PROD (Node C). [ ] Start sync jobs on *BACKUP BACKUP2 (Node B).